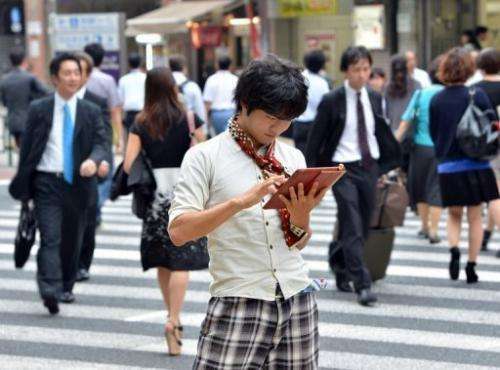 University student Akihiro Matsumura uses his tablet computer in Tokyo on June 19, 2013. Computers and smartphones have relieved youngsters like Matsumura of the need to remember how to write the thousands of Chinese characters or kanji in use across East Asia. "Sometimes I don't even bother to take notes in seminars. I just take out my tablet to shoot pictures of what instructors write on blackboards," he told AFP. Like millions of people across East Asia, 23-year-old Matsumura is forgetting the pictographs and ideographs that have been used in Japan and greater China for centuries. While some bemoan what they see as the loss of history and culture, others say the shift frees up brainpower for more useful things, like foreign languages, and even improves writing as a whole. Naoko Matsumoto, a professor of law who heads international legal studies at the prestigious Sophia University near Tokyo, said the students in her classes now write more fluently than their predecessors. "I'm in my 40s and compared with my generation, they have more and more opportunities to write using Twitter" and other social networking services, she said. "I think they are actually better at writing" because they write in a simple and easy-to-understand way, she said. Priorities are changing with more emphasis placed on building logical thinking strategies—a case of content becoming more important than form. "The skill of handwriting kanji (Chinese characters) perfectly is becoming less necessary compared with earlier times," the professor said. Kanji developed in China as a mixture of pictographs—characters that represent a thing, like "mountain"—and ideographs—those that depict an abstract concept, like "think". Greater China uses only these characters—a simplified version on the mainland and the traditional form in Taiwan and Hong Kong. Japan imported kanji some time during the first millennium to use as a writing system, despite there being no linguistic link between Japanese and Chinese. By around the 8th-9th centuries, it developed a syllabary—a system of consonant/vowel blends—called "hiragana". Akihiro Matsumura (L) uses his tablet computer as his friend practices writing Chinese characters in Tokyo on June 19, 2013. Like millions of people across East Asia, Matsumura is forgetting the pictographs and ideographs that have been used in Japan and greater China for centuries. Where kanji contain a meaning, but no inherent sound, each hiragana character represents a sound, but has no inherent meaning—like a letter in the Latin alphabet. Unlike the alphabet, however, each syllable only ever has one sound. A second syllabary, called "katakana", also developed. Modern-day written Japanese is a mixture of kanji, hiragana and katakana, with an increasing amount of Western script also thrown in (known as "romaji" or Roman letters). In both Chinese and Japanese, computer and smartphone users need only to type the pronunciation of the kanji from the constituent sounds using either the syllabary or the alphabet. They then choose one of several options offered by the device. Very different meanings can come from the same sounds. For example, in Japanese, "shigaisen" produces "street fighting" and "ultra-violet rays". "It's easy to forget even the easiest of characters," said Zhang Wentong, an assistant at a calligraphy centre in Beijing. "Sometimes you've got to think for ages. Occasionally I'll repeatedly type the character out phonetically in my phone" until the right one pops up. Graduate student Matsumura said his reliance on devices leaves him adrift when faced with filling in forms for repairs at the electronics shop where he works part-time. "I sometimes can't recall kanji on the spot while a customer is watching me," he said. "I remember their rough shapes but can't remember exact strokes... It's foggy." Traditionalists fear that forgetting kanji means the irrevocable loss of a fundamental part of culture. In Hong Kong, Rebecca Ko said her 11-year-old daughter uses the computer more and more, but she insists the child learn traditional characters, and sends her to a Chinese calligraphy class. "We cannot rely too much on computers, we should be able to write... (and) we should be able to write neatly, it's a basic thing about being Chinese," she said. 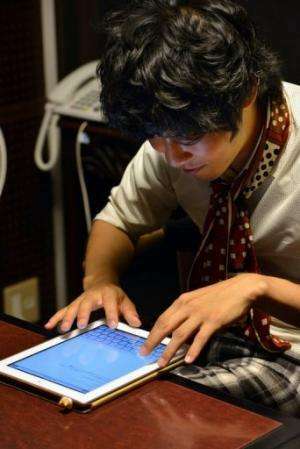 University student Akihiro Matsumura writes sentences on a tablet computer in Tokyo on June 19, 2013. In both Chinese and Japanese, computer and smartphone users need only to type the pronunciation of the kanji from the constituent sounds using either the syllabary or the alphabet. But, says Matsumura, times change and the spread of technology gives people opportunities to develop their language capability in other ways, for example allowing some to read more. "I'm one of them. I used to listen to music blankly on trains, but I now read news and other things," he said. Guardians of the characters say there is no evidence of any drop-off in enthusiasm. The Japan Kanji Aptitude Testing Foundation, a Kyoto-based organisation, says the number of people who take its exam every year is holding steady at around two million. People are "increasingly using text messages rather than making phone calls", which means they need to know which characters to use, said a spokeswoman. And kanji characters are not falling out of favour with all younger people. Yusuke Kinouchi, a 24-year-old graduate student at the Tokyo Institute of Technology, thought children should keep learning the characters in the way they have done for hundreds of years. Kanji provide a certain economy, he said, where one character can stand in for the sounds made by several letters in a language such as English—something particularly useful on Twitter, for example, with its 140-character limit. But beyond the economy, there is one other good reason to keep them alive, he said. The Japanese are not forgetting the kanjis, they are forgetting how to write them by hand. The use of technology makes it really easy to type in a text in kanji (and it is easier to write in Japanese on a phone than English or french..). - more easily usable kanjis, enabling to use them more often and to use more of them. Drawn to an unread poem.